In Tiberian Sun these were (un)used for Theather-Specific colors, and worked ingame. Is there a way to re-enable these colors or adding others in its place? 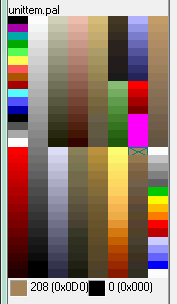 Will the game read the previously-unused colors by simply putting the modified palette, or is there other changes you need to do? 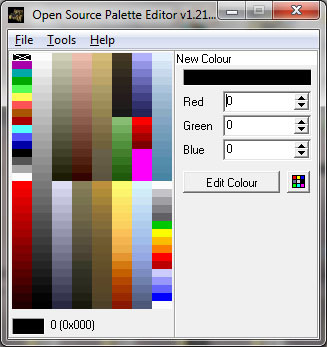 I seem to recall too that some modders sucessfully used palettes using these colors, however they may have modified other files too for them to work. For example, I am aware of the existance of .vpl files used for voxels. If so, how to do that? I don't see why it shouldn't work. There's nothing hardcoded here. It's unittem.pal for one theater and unitsno.pal for the other. No clue if RA2 has unitlun.pal for lunar or something like that. Other than that, with exception of transparent, shadow, remap and the glow colors, every other color can be changed without any hardcoded sideeffect. you only have to edit the vpl, if you also want these edited colors to work on voxels as well. 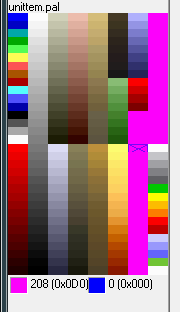 Well the obviously easy option is copy unitsno->unittem/uniturb which has the pink areas filled with pale blues. Can you explain about color 204 to 207 ? I see they still Magenta in any theather. It's just unused by WW, you can change it to any color you want and it'll work. I don't know how to edit the .vpl, is there any tutorial on that? 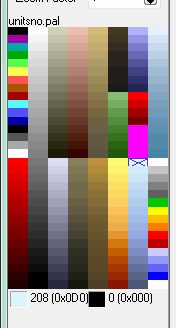 What color index in unit*.pal is ABSOLUTELY not used in the original game? Currently turreted SHP units are forced unit*.pal and it's too colorless. There aren't any tutorials for editing the VPL but all the information you'll need can be found here.